The OperationContractAttribute is used, in WCF, to define operations on a service contract. This attribute contains the AsyncPattern property that can be used to implement or use services asynchronously. The first [OperationContract], which has AsyncPattern set to false (the default), defines one request-response operation called ‘Operation1’. This operation is implemented synchronously by one method: Operation1. Synchronously means that the WCF dispatcher will call the Operation1 method, passing the RequestData. This call will block during the execution of the operation. Finally, the method returns the ReplyData that will be used in the response sent to the client. The WCF dispatcher will call the BeginOperation2 method, passing the RequestData, an AsyncCallback and some state information. This method should start the execution of the operation and return an IAsyncResult immediately. 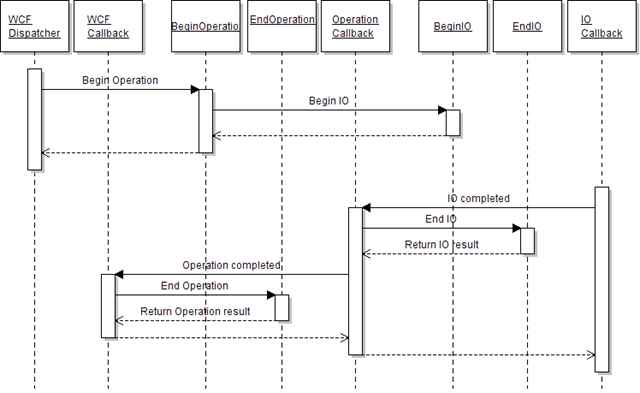 When the execution of the operation is completed, then the AsyncCallback should be called. This AsyncCallback, implemented by the WCF runtime, will then call EndOperation2 to collect the ReplyData that will be used in the response sent to the client. Note that, when using AsyncPattern set to true, there is no longer a 1-to-1 relation between the service contract methods and the service operations. Namely, the BeginOperation2 and EndOperation2 methods are both associated to a single operation named ‘Operation2’. So, concluding, the AsyncPattern is an implementation detail of the service: it defines the communication pattern between the WCF runtime and the service implementation but not the communication pattern between the service client and the service. This entry was posted in Uncategorized and tagged concurrency, WCF on June 27, 2008 by pedrofelix.